The bg just blows me away. The effects are nicely done. The colors blend together very well. Vincent just looks cool in this wall. Another good work >_< I know you have put an explosion effect behind Vincent but that would match better if you can put more effect and more him and his hair clearer >_< That is good wall instead ^^ Keep it up ! it looks great!! still love the colors in the back!! aparently this dude is named Vincent?? who is he?? am i cluless or wut?... hm i'll go w/cluless! well an ohter great walli to add to my favorites!!! maybe you can do something about it to make us focus more on the one and only hot vincent? by the way, nice colours..
Now i can see it better nice work and it's from FF7 advent children. COOL!!! lol... This wall is excellent; the bg is awsome and the extraction is terrific!! This is a very very cool advent children wall! Good job! Adding it to my favs! Nice wall my friend!! very nice!! I like much!!!!!! nn!! 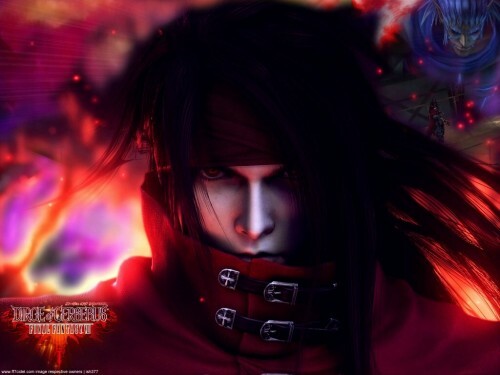 I think that final fantasy VII is great!! and you?? Thanks a lot for sharing this xD!! Try doing some more stuff with that trick you do with the colors, its very cool. Try to avoid using scans for a while so you'll be able to see what else you can do with it. Anyways, as for this sub.. its very superb. I forgot to comment when you first submitted it, though. So I'm here again. Sorry 4 not posting a comment its just that its hard to put word how awesome it is with out repeating the comments from above. Cool contrast of colours, hontou! O.O also it looks so gooood :) Brushwork skillz rawks on this wall ^_^ Yup a final fantasy wall huh...? Yay! thankies! me luv final fantasy games! keep up n gd luck dyude on ur next workz!